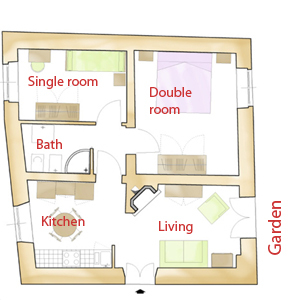 This apartment has a double and a single bedroom sharing a bathroom. The french windows of the living room open onto a west facing terrace with beautiful views onto the garden of the estate, the pool, woods and the setting sun. Merci beaucoup pour votre accueil attentionné et tous vos excellents conseils! Nous avons passé un très beau séjour en Toscane, le Chianti est vraiment magnifique au printemps. Nous ne manquerons pas de reprendre contact avec vous pour d'autres séjours en Italie!